How to use and why to use Facebook Group - LinkedIn Group? 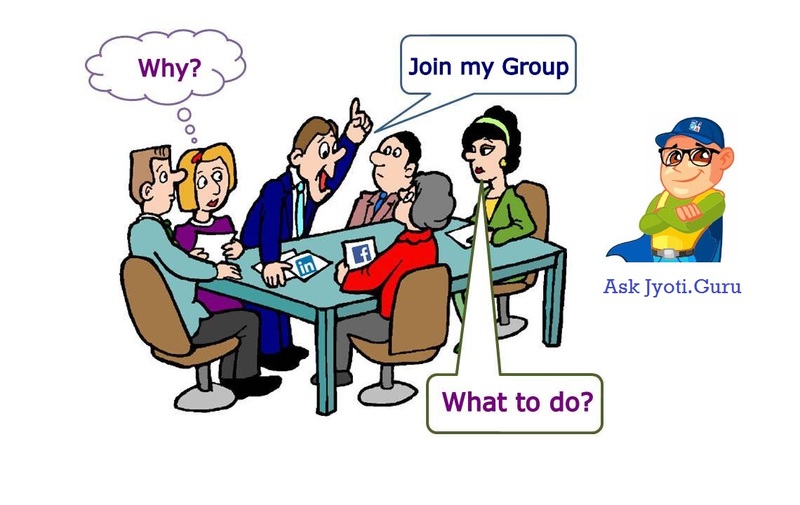 FAQ about social media groups and answers that will help you to use the online groups effectively. Study these important points while joining online community to get maximum benefits and stay away from avoidable issues. Here are the best practices to help you become a valued group member. Make the most of your group by using the same manners you would use to interact at a social event or a friend's house. Make sure your conversations are relevant to the interests and purpose of the group. Look at the Group Description (on right side in facebook group) and ABOUT THIS GROUP as well as Group Rules (on right side of LinkedIn group). Start or participate in a conversations. Do not be a passive audience. Engage with posts - Like and Comment will help you increase your own visibility (and credibility). [Usually people expect that "my post members should Like or Comment" but did you do the same? It is similar to everyone want to do batting only and not fielding. Group will be vibrant only if all participate in the discussion. Invite discussion. Ask for members' input on a topic or article that you share and phrase your update as a question. It is OK to disagree; if you find yourself disagreeing in a conversation, remember to keep discussion respectful. I have created two kinds of groups: (1) Focused Groups: Specific interest or topic or industry or profession group. (2) Geographical groups: Group members are stake holders of a specific city (Country). Here you can do self-promotion. Use it to promote your products / services to your targeted city or community. About 80 % of your posts should add value to group members. Show-off your expertise instead of always marketing (restrict advertisements to about 20%). Usual mistake is that people only post their advertisements. How often one should post? Post need not be daily. Four or less posts in a week is recommended. Sharing other websites that could be useful to members is a good way to increase your visibility and credibility (as an individual). What is in it for marketeers? The idea is to pause as a thought leader! If you're sharing a link or article, if possible provide context on its relevance to the group. What is in it for HR? On LinkedIn, if you're sharing a job opening with a group, post it under the Jobs tab. Once you are member, it is your group, so you can report spam (to admin) when you see it. Reporting spam helps everybody in the group, and it helps Admin / managers / Moderators to take appropriate action. When fellow group members or group management feel that certain contributions do not meet their group's objective, they can take actions like reporting or removing comments, or even removing and blocking you from a group. Use Business Page to promote your business / company instead of groups. Use group to become an influencer in the society, as an individual, human, so it is not a good idea to post as company. Post in group as a person. Groups are all about building relationships through the conversation about topics and ideas with a two-way dialogue. Use groups to publish your ideas to reach a wider audience, beyond your own friends circle, thereby reaching to more clients. Digital platforms offers a great opportunity to demonstrate your knowledge in a certain area to a broad audience with the purpose of promoting ideas, as opposed to promoting commercial services. Why Post? Your posts are tied to your facebook / LinkedIn identity and provide an effective way to stand out from the crowd while building your professional reputation.